The OSI Physical layer provides the means to transport across the network media the bits that make up a Data Link layer frame. This layer accepts a complete frame from the Data Link layer and encodes it as a series of signals that are transmitted onto the local media. The encoded bits that comprise a frame are received by either an end device or an intermediate device. At this stage of the communication process, the user data has been segmented by the Transport layer, placed into packets by the Network layer, and further encapsulated as frames by the Data Link layer. The purpose of the Physical layer is to create the electrical, optical, or microwave signal that represents the bits in each frame. These signals are then sent on the media one at a time. It is also the job of the Physical layer to retrieve these individual signals from the media, restore them to their bit representations, and pass the bits up to the Data Link layer as a complete frame. The media does not carry the frame as a single entity. The media carries signals, one at a time, to represent the bits that make up the frame. The representation of the bits - that is, the type of signal - depends on the type of media. 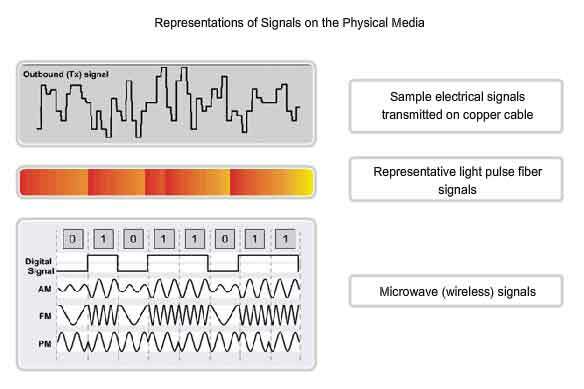 For copper cable media, the signals are patterns of electrical pulses. For fiber, the signals are patterns of light. 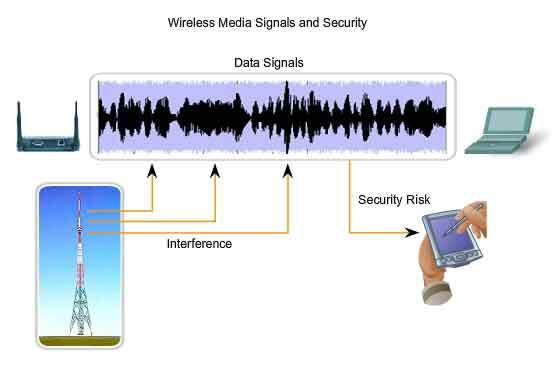 For wireless media, the signals are patterns of radio transmissions. When the Physical layer encodes the bits into the signals for a particular medium, it must also distinguish where one frame ends and the next frame begins. Otherwise, the devices on the media would not recognize when a frame has been fully received. In that case, the destination device would only receive a string of signals and would not be able to properly reconstruct the frame. As described in the previous chapter, indicating the beginning of frame is often a function of the Data Link layer. However, in many technologies, the Physical layer may add its own signals to indicate the beginning and end of the frame. To enable a receiving device to clearly recognize a frame boundary, the transmitting device adds signals to designate the start and end of a frame. These signals represent particular bit patterns that are only used to denote the start or end of a frame. The process of encoding a frame of data from the logical bits into the physical signals on the media, and the characteristics of particular physical media, are covered in detail in the following sections of this chapter. 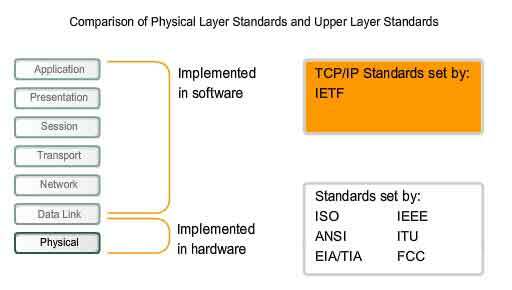 Hardware components such as network adapters (NICs), interfaces and connectors, cable materials, and cable designs are all specified in standards associated with the Physical layer. The physical elements are the electronic hardware devices, media and connectors that transmit and carry the signals to represent the bits. Encoding is a method of converting a stream of data bits into a predefined code. Codes are groupings of bits used to provide a predictable pattern that can be recognized by both the sender and the received. Using predictable patterns helps to distinguish data bits from control bits and provide better media error detection. 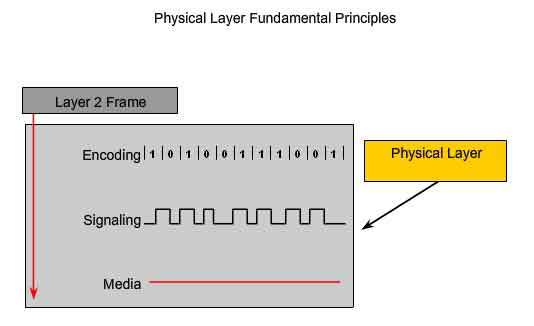 In addition to creating codes for data, encoding methods at the Physical layer may also provide codes for control purposes such as identifying the beginning and end of a frame. The transmitting host will transmit the specific pattern of bits or a code to identify the beginning and end of the frame. The Physical layer must generate the electrical, optical, or wireless signals that represent the "1" and "0" on the media. The method of representing the bits is called the signaling method. The Physical layer standards must define what type of signal represents a "1" and a "0". This can be as simple as a change in the level of an electrical signal or optical pulse or a more complex signaling method. Eventually, all communication from the human network becomes binary digits, which are transported individually across the physical media. Although all the bits that make up a frame are presented to the Physical layer as a unit, the transmission of the frame across the media occurs as a stream of bits sent one at a time. The Physical layer represents each of the bits in the frame as a signal. Each signal placed onto the media has a specific amount of time to occupy the media. This is referred to as its bit time. Signals are processed by the receiving device and returned to its representation as bits. 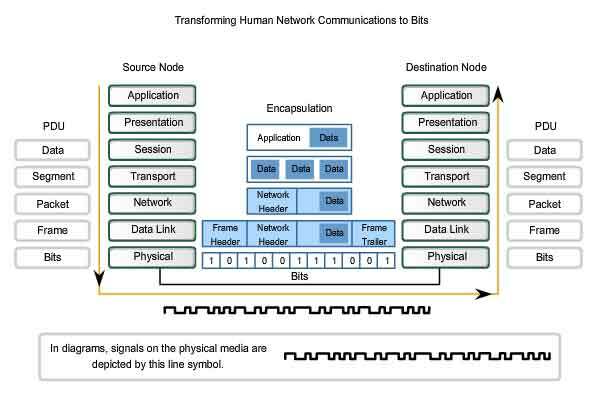 At the Physical layer of the receiving node, the signals are converted back into bits. The bits are then examined for the start of frame and end of frame bit patterns to determine that a complete frame has been received. The Physical layer then delivers all the bits of a frame to the Data Link layer. Successful delivery of the bits requires some method of synchronization between transmitter and receiver. The signals representing the bits must be examined at specific times during the bit time to properly determine if the signal represents a "1" or a "0". The synchronization is accomplished by the use of a clock. In LANs, each end of the transmission maintains its own clock. Many signaling methods use predictable transitions in the signal to provide synchronization between the clocks of the transmitting and the receiving devices. The nature of the actual signals representing the bits on the media will depend on the signaling method in use. Some methods may use one attribute of signal to represent a single 0 and use another attribute of signal to represent a single 1. As an example, with Non-Return to Zero (NRZ), a 0 may be represented by one voltage level on the media during the bit time and a 1 might be represented by a different voltage on the media during the bit time. There are also methods of signaling that use transitions, or the absence of transitions, to indicate a logic level. For example, Manchester Encoding indicates a 0 by a high to low voltage transition in the middle of the bit time. For a 1 there is a low to high voltage transition in the middle of the bit time. The signaling method used must be compatible with a standard so that the receiver can detect the signals and decode them. The standard contains an agreement between the transmitter and the receiver on how to represent 1s and 0s. If there is no signaling agreement - that is, if different standards are used at each end of the transmission - communication across the physical medium will fail. Signaling methods to represent bits on the media can be complex. We will look at two of the simpler techniques to illustrate the concept. As a first example, we will examine a simple signaling method, Non Return to Zero (NRZ). 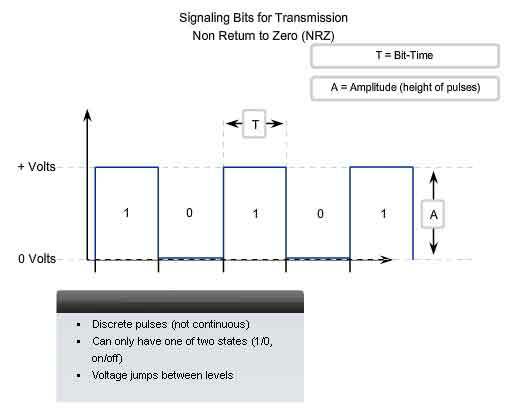 In NRZ, the bit stream is transmitted as a series of voltage values, as shown in the figure. A low voltage value represents a logical 0 and a high voltage value represents a logical 1. The voltage range depends on the particular Physical layer standard in use. This simple method of signaling is only suited for slow speed data links. NRZ signaling uses bandwidth inefficiently and is susceptible to electromagnetic interference. Additionally, the boundaries between individual bits can be lost when long strings of 1s or 0s are transmitted consecutively. In that case, no voltage transitions are detectable on the media. Therefore, the receiving nodes do not have a transition to use in resynchronizing bit times with the transmitting node. 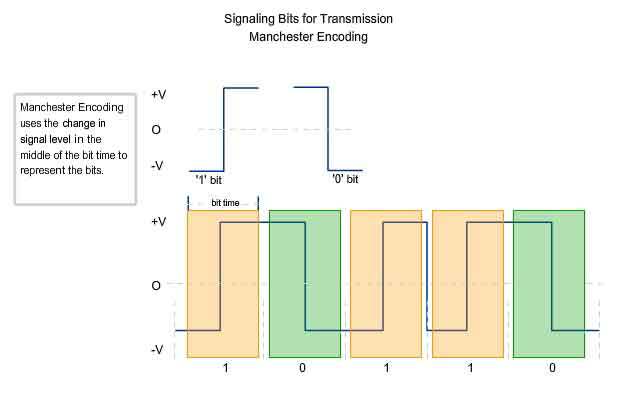 Instead of representing bits as pulses of simple voltage values, in the Manchester Encoding scheme, bit values are represented as voltage transitions. For example, a transition from a low voltage to a high voltage represents a bit value of 1. A transition from a high voltage to a low voltage represents a bit value of 0. As shown in the figure, one voltage transition must occur in the middle of each bit time. This transition can be used to ensure that the bit times in the receiving nodes are synchronized with the transmitting node. The transition in the middle of the bit time will be either the up or down direction for each unit of time in which a bit is transmitted. For consecutive bit values, a transition on the bit boundary "sets up" the appropriate mid-bit time transition that represents the bit value. Although Manchester Encoding is not efficient enough to be used at higher signaling speeds, it is the signaling method employed by 10BaseT Ethernet (Ethernet running at 10 Megabits per second). In the prior section, we describe the signaling process as how bits are represented on physical media. In this section, we use of the word encoding to represent the symbolic grouping of bits prior to being presented to the media. By using an encoding step before the signals are placed on the media, we improve the efficiency at higher speed data transmission. As we use higher speeds on the media, we have the possibility that data will be corrupted. By using the coding groups, we can detect errors more efficiently. Additionally, as the demand for data speeds increase, we seek ways to represent more data across the media, by transmitting fewer bits. Coding groups provide a method of making this data representation. The Physical layer of a network device needs to be able to detect legitimate data signals and ignore random non-data signals that may also be on the physical medium. The stream of signals being transmitted needs to start in such a way that the receiver recognizes the beginning and end of the frame. 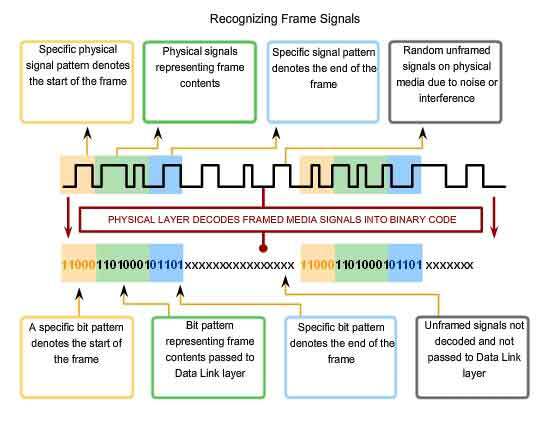 One way to provide frame detection is to begin each frame with a pattern of signals representing bits that the Physical layer recognizes as denoting the start of a frame. Another pattern of bits will signal the end of the frame. Signal bits not framed in this manner are ignored by the Physical layer standard being used. Valid data bits need to be grouped into a frame; otherwise, data bits will be received without any context to give them meaning to the upper layers of the networking model. This framing method can be provided by the Data Link layer, the Physical layer, or by both. The figure depicts some of the purposes of signaling patterns. Signal patterns can indicate: start of frame, end of frame, and frame contents. These signal patterns can be decoded into bits. The bits are interpreted as codes. The codes indicate where the frames start and stop. Encoding techniques use bit patterns called symbols. The Physical layer may use a set of encoded symbols - called code groups - to represent encoded data or control information. 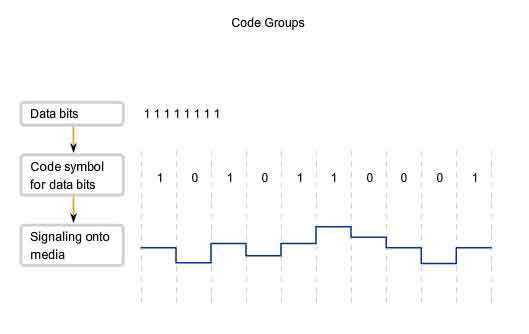 A code group is a consecutive sequence of code bits that are interpreted and mapped as data bit patterns. For example, code bits 10101 could represent the data bits 0011. As shown in the figure, code groups are often used as an intermediary encoding technique for higher speed LAN technologies. This step occurs at the Physical layer prior to the generation of signals of voltages, light pulses, or radio frequencies. By transmitting symbols, the error detection capabilities and timing synchronization between transmitting and receiving devices are enhanced. These are important considerations in supporting high speed transmission over the media. Although using code groups introduces overhead in the form of extra bits to transmit, they improve the robustness of a communications link. This is particularly true for higher speed data transmission. 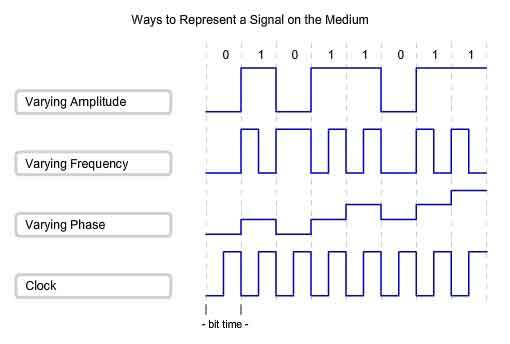 To properly detect an individual bit as a 0 or as a 1, the receiver must know how and when to sample the signal on the media. This requires that the timing between the receiver and transmitter be synchronized. In many Physical layer technologies, transitions on the media are used for this synchronization. If the bit patterns being transmitted on the media do not create frequent transitions, this synchronization may be lost and individual bit error can occur. Code groups are designed so that the symbols force an ample number of bit transitions to occur on the media to synchronize this timing. They do this by using symbols to ensure that not too many 1s or 0s are used in a row. In many code groups, the symbols ensure that the number of 1s and 0s in a string of symbols are evenly balanced. The process of balancing the number of 1s and 0s transmitted is called DC balancing. This prevents excessive amounts of energy from being injected into the media during transmission, thereby reducing the interference radiated from the media. In many media signaling methods, a logic level, for example a 1, is represented by the presence of energy being sent into the media while the opposite logic level, a 0, is represented as the absence of this energy. Transmitting a long series of 1s could overheat the transmitting laser and the photo diodes in the receiver, potentially causing higher error rates. Data symbols - Symbols that represent the data of the frame as it is passed down to the Physical layer. Control symbols - Special codes injected by the Physical layer used to control transmission. These include end-of-frame and idle media symbols. Invalid symbols - Symbols that have patterns not allowed on the media. The receipt of an invalid symbol indicates a frame error. 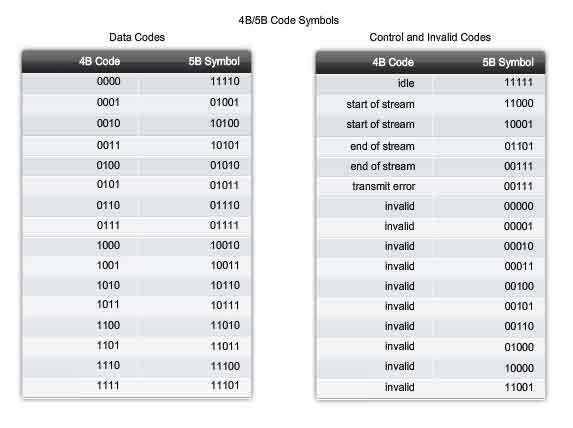 In addition to the data symbols and control symbols, code groups contain invalid symbols. These are the symbols that could create long series of 1s or 0s on the media; therefore, they are not used by the transmitting node. If a receiving node receives one of these patterns, the Physical layer can determine that there has been an error in data reception. An example, we will examine a simple code group called 4B/5B. Code groups that are currently used in modern networks are generally more complex. In this technique, 4 bits of data are turned into 5-bit code symbols for transmission over the media system. In 4B/5B, each byte to be transmitted is broken into four-bit pieces or nibbles and encoded as five-bit values known as symbols. These symbols represent the data to be transmitted as well as a set of codes that help control transmission on the media. Among the codes are symbols that indicate the beginning and end of the frame transmission. Although this process adds overhead to the bit transmissions, it also adds features that aid in the transmission of data at higher speeds. 4B/5B ensures that there is at least one level change per code to provide synchronization. Most of the codes used in 4B/5B balance the number of 1s and 0s used in each symbol. As shown in the figure, 16 of the possible 32 combinations of code groups are allocated for data bits, and the remaining code groups are used for control symbols and invalid symbols. Six of the symbols are used for special functions identifying the transition from idle to frame data and end of stream delimiter. The remaining 10 symbols indicate invalid codes. The capacity of a medium to carry data is described as the raw data bandwidth of the media. Digital bandwidth measures the amount of information that can flow from one place to another in a given amount of time. Bandwidth is typically measured in kilobits per second (kbps) or megabits per second (Mbps). The practical bandwidth of a network is determined by a combination of factors: the properties of the physical media and the technologies chosen for signaling and detecting network signals. Physical media properties, current technologies, and the laws of physics all play a role in determining available bandwidth. Throughput is the measure of the transfer of bits across the media over a given period of time. Due to a number of factors, throughput usually does not match the specified bandwidth in Physical layer implementations such as Ethernet. Many factors influence throughput. Among these factors are the amount of traffic, the type of traffic, and the number of network devices encountered on the network being measured. In a multi-access topology such as Ethernet, nodes are competing for media access and its use. Therefore, the throughput of each node is degraded as usage of the media increases. In an internetwork or network with multiple segments, throughput cannot be faster than the slowest link of the path from source to destination. Even if all or most of the segments have high bandwidth, it will only take one segment in the path with low throughput to create a bottleneck to the throughput of the entire network. A third measurement has been created to measure the transfer of usable data. That measure is known as goodput. 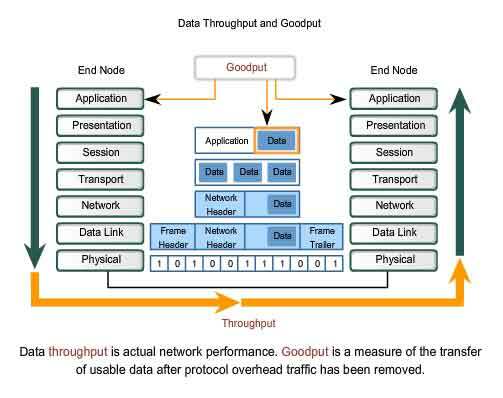 Goodput is the measure of usable data transferred over a given period of time, and is therefore the measure that is of most interest to network users. As shown in the figure, goodput measures the effective transfer of user data between Application layer entities, such as between a source web server process and a destination web browser device. Unlike throughput, which measures the transfer of bits and not the transfer of usable data, goodput accounts for bits devoted to protocol overhead. Goodput is throughput minus traffic overhead for establishing sessions, acknowledgements, and encapsulation. As an example, consider two hosts on a LAN transferring a file. The bandwidth of the LAN is 100 Mbps. Due to the sharing and media overhead the throughput between the computers is only 60 Mbps. With the overhead of the encapsulation process of the TCP/IP stack, the actual rate of the data received by the destination computer, goodput, is only 40Mbps. The Physical layer is concerned with network media and signaling. This layer produces the representation and groupings of bits as voltages, radio frequencies, or light pulses. 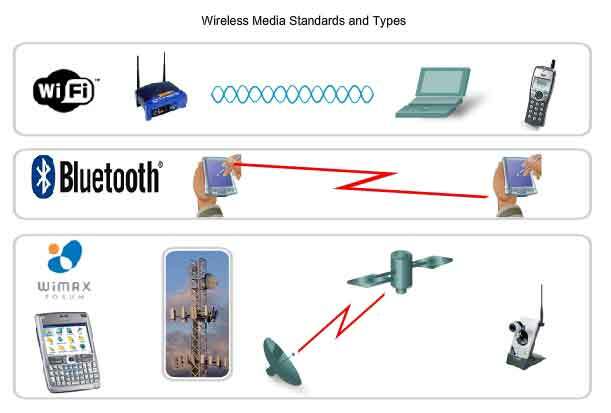 Various standards organizations have contributed to the definition of the physical, electrical, and mechanical properties of the media available for different data communications. These specifications guarantee that cables and connectors will function as anticipated with different Data Link layer implementations. The figure shows some of the characteristics of networking media. 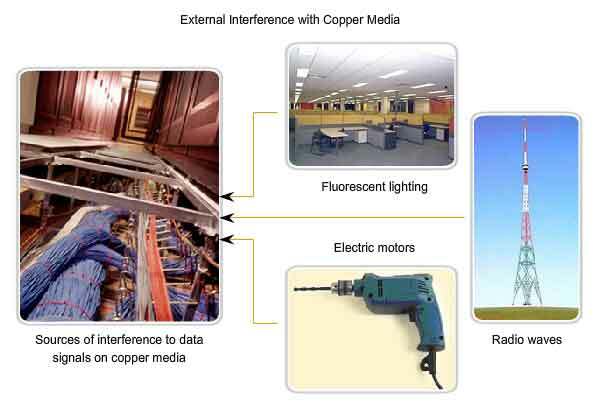 This section will also describe some of the important characteristics of commonly used copper, optical, and wireless media. The most commonly used media for data communications is cabling that uses copper wires to signal data and control bits between network devices. Cabling used for data communications usually consists of a series of individual copper wires that form circuits dedicated to specific signaling purposes. Other types of copper cabling, known as coaxial cable, have a single conductor that runs through the center of the cable that is encased by, but insulated from, the other shield. 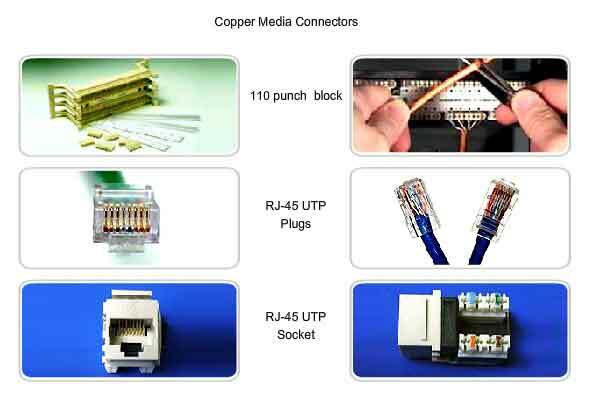 The copper media type chosen is specified by the Physical layer standard required to link the Data Link layers of two or more network devices. These cables can be used to connect nodes on a LAN to intermediate devices, such as routers and switches. Cables are also used to connect WAN devices to a data services provider such as a telephone company. Each type of connection and the accompanying devices have cabling requirements stipulated by Physical layer standards. Networking media generally make use of modular jacks and plugs, which provide easy connection and disconnection. Also, a single type of physical connector may be used for multiple types of connections. For example, the RJ-45 connector is used widely in LANs with one type of media and in some WANs with another media type. Data is transmitted on copper cables as electrical pulses. A detector in the network interface of a destination device must receive a signal that can be successfully decoded to match the signal sent. The timing and voltage values of these signals are susceptible to interference or "noise" from outside the communications system. These unwanted signals can distort and corrupt the data signals being carried by copper media. Radio waves and electromagnetic devices such as fluorescent lights, electric motors, and other devices are potential sources of noise. 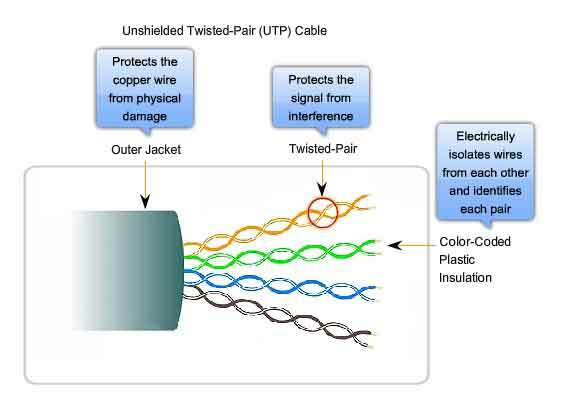 Unshielded twisted-pair (UTP) cabling, as it is used in Ethernet LANs, consists of four pairs of color-coded wires that have been twisted together and then encased in a flexible plastic sheath. As seen in the figure, the color codes identify the individual pairs and wires in the pairs and aid in cable termination. The twisting has the effect of canceling unwanted signals. When two wires in an electrical circuit are placed close together, external electromagnetic fields create the same interference in each wire. The pairs are twisted to keep the wires in as close proximity as is physically possible. When this common interference is present on the wires in a twisted pair, the receiver processes it in equal yet opposite ways. As a result, the signals caused by electromagnetic interference from external sources are effectively cancelled. This cancellation effect also helps avoid interference from internal sources called crosstalk. Crosstalk is the interference caused by the magnetic field around the adjacent pairs of wires in the cable. When electrical current flows through a wire, it creates a circular magnetic field around the wire. With the current flowing in opposite directions in the two wires in a pair, the magnetic fields - as equal but opposite forces - have a cancellation effect on each other. Additionally, the different pairs of wires that are twisted in the cable use a different number of twists per meter to help protect the cable from crosstalk between pairs. The electrical characteristics of copper cabling are defined by the Institute of Electrical and Electronics Engineers (IEEE). IEEE rates UTP cabling according to its performance. Cables are placed into categories according to their ability to carry higher bandwidth rates. For example, Category 5 (Cat5) cable is used commonly in 100BASE-TX FastEthernet installations. Other categories include Enhanced Category 5 (Cat5e) cable and Category 6 (Cat6). Cables in higher categories are designed and constructed to support higher data rates. As new gigabit speed Ethernet technologies are being developed and adopted, Cat5e is now the minimally acceptable cable type, with Cat6 being the recommended type for new building installations. Some people connect to data network using existing telephone systems. Often the cabling in these systems are some form of UTP that are lower grade than the current Cat5+ standards. Installing less expensive but lower rated cabling is potentially wasteful and shortsighted. If the decision is later made to adopt a faster LAN technology, total replacement of the installed cable infrastructure may be required. 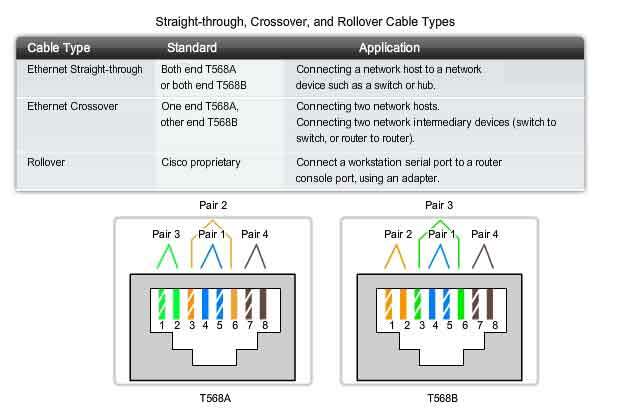 Using a crossover or straight-through cable incorrectly between devices may not damage the devices, but connectivity and communication between the devices will not take place. This is a common error in the lab and checking that the device connections are correct should be the first troubleshooting action if connectivity is not achieved. 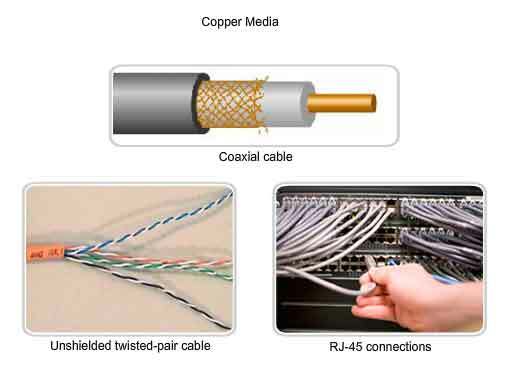 Coaxial cable consists of a copper conductor surrounded by a layer of flexible insulation, as shown in the figure. Over this insulating material is a woven copper braid, or metallic foil, that acts as the second wire in the circuit and as a shield for the inner conductor. This second layer, or shield, also reduces the amount of outside electromagnetic interference. Covering the shield is the cable jacket. All the elements of the coaxial cable encircle the center conductor. Because they all share the same axis, this construction is called coaxial, or coax for short. The coaxial cable design has been adapted for different purposes. Coax is an important type of cable that is used in wireless and cable access technologies. Coax cables are used to attach antennas to wireless devices. The coaxial cable carries radio frequency (RF) energy between the antennas and the radio equipment. Coax is also the most widely used media for transporting high radio frequency signals over wire, especially cable television signals. Traditional cable television, exclusively transmitting in one direction, was composed completely of coax cable. Cable service providers are currently converting their one-way systems to two-way systems to provide Internet connectivity to their customers. To provide these services, portions of the coaxial cable and supporting amplification elements are replaced with multi-fiber-optic cable. However, the final connection to the customer's location and the wiring inside the customer's premises is still coax cable. This combined use of fiber and coax is referred to as hybrid fiber coax (HFC). In the past, coaxial cable was used in Ethernet installations. Today UTP offers lower costs and higher bandwidth than coaxial and has replaced it as the standard for all Ethernet installations. 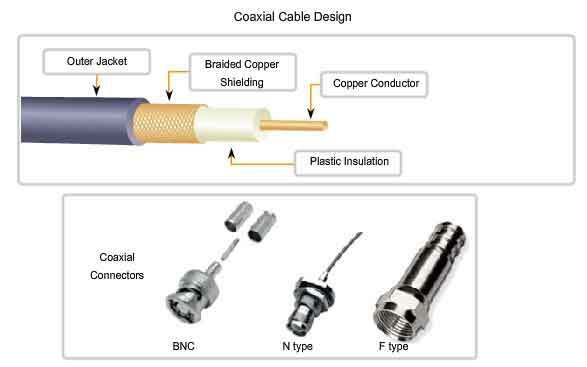 There are different types of connectors used with coax cable. The figure shows some of these connector types. 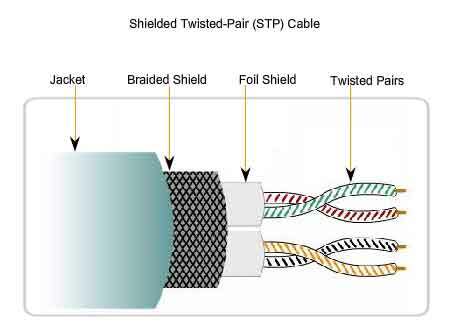 Another type of cabling used in networking is shielded twisted-pair (STP). As shown in the figure, STP uses two pairs of wires that are wrapped in an overall metallic braid or foil. STP cable shields the entire bundle of wires within the cable as well as the individual wire pairs. STP provides better noise protection than UTP cabling, however at a significantly higher price. For many years, STP was the cabling structure specified for use in Token Ring network installations. With the use of Token Ring declining, the demand for shielded twisted-pair cabling has also waned. The new 10 GB standard for Ethernet has a provision for the use of STP cabling. This may provide a renewed interest in shielded twisted-pair cabling. A potential problem with copper media is that the copper wires could conduct electricity in undesirable ways. This could subject personnel and equipment to a range of electrical hazards. A defective network device could conduct currents to the chassis of other network devices. Additionally, network cabling could present undesirable voltage levels when used to connect devices that have power sources with different ground potentials. Such situations are possible when copper cabling is used to connect networks in different buildings or on different floors of buildings that use different power facilities. Finally, copper cabling may conduct voltages caused by lightning strikes to network devices. The result of undesirable voltages and currents can include damage to network devices and connected computers, or injury to personnel. It is important that copper cabling be installed appropriately, and according to the relevant specifications and building codes, in order to avoid potentially dangerous and damaging situations. Cable insulation and sheaths may be flammable or produce toxic fumes when heated or burned. Building authorities or organizations may stipulate related safety standards for cabling and hardware installations. Fiber-optic cabling uses either glass or plastic fibers to guide light impulses from source to destination. The bits are encoded on the fiber as light impulses. Optical fiber cabling is capable of very large raw data bandwidth rates. Most current transmission standards have yet to approach the potential bandwidth of this media. At present, in most enterprise environments, optical fiber is primarily used as backbone cabling for high-traffic point-to-point connections between data distribution facilities and for the interconnection of buildings in multi-building campuses. Because optical fiber does not conduct electricity and has low signal loss, it is well suited for these uses. Optical fiber cables consist of a PVC jacket and a series of strengthening materials that surround the optical fiber and its cladding. The cladding surrounds the actual glass or plastic fiber and is designed to prevent light loss from the fiber. Because light can only travel in one direction over optical fiber, two fibers are required to support full duplex operation. Fiber-optic patch cables bundle together two optical fiber cables and terminate them with a pair of standard single fiber connectors. 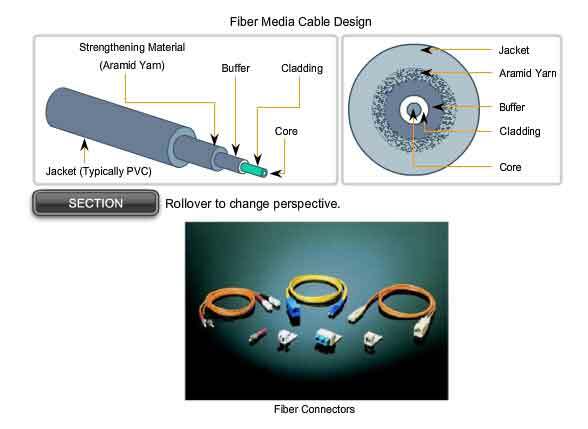 Some fiber connectors accept both the transmitting and receiving fibers in a single connector. Either lasers or light emitting diodes (LEDs) generate the light pulses that are used to represent the transmitted data as bits on the media. Electronic semi-conductor devices called photodiodes detect the light pulses and convert them to voltages that can then be reconstructed into data frames. Note: The laser light transmitted over fiber-optic cabling can damage the human eye. Care must be taken to avoid looking into the end of an active optical fiber. Fiber optic cables can be broadly classified into two types: single-mode and multimode. Single-mode optical fiber carries a single ray of light, usually emitted from a laser. Because the laser light is uni-directional and travels down the center of the fiber, this type of fiber can transmit optical pulses for very long distances. 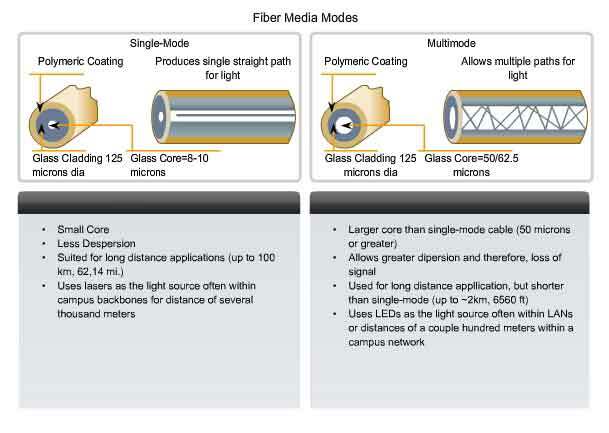 Multimode fiber typically uses LED emitters that do not create a single coherent light wave. Instead, light from an LED enters the multimode fiber at different angles. Because light entering the fiber at different angles takes different amounts of time to travel down the fiber, long fiber runs may result in the pulses becoming blurred on reception at the receiving end. This effect, known as modal dispersion, limits the length of multimode fiber segments. Multimode fiber, and the LED light source used with it, are cheaper than single-mode fiber and its laser-based emitter technology. Wireless media carry electromagnetic signals at radio and microwave frequencies that represent the binary digits of data communications. As a networking medium, wireless is not restricted to conductors or pathways, as are copper and fiber media. Wireless data communication technologies work well in open environments. However, certain construction materials used in buildings and structures, and the local terrain, will limit the effective coverage. In addition, wireless is susceptible to interference and can be disrupted by such common devices as household cordless phones, some types of fluorescent lights, microwave ovens, and other wireless communications. Further, because wireless communication coverage requires no access to a physical strand of media, devices and users who are not authorized for access to the network can gain access to the transmission. Therefore, network security is a major component of wireless network administration. Standard IEEE 802.11 - Commonly referred to as Wi-Fi, is a Wireless LAN (WLAN) technology that uses a contention or non-deterministic system with a Carrier Sense Multiple Access/Collision Avoidance (CSMA/CA) media access process. Standard IEEE 802.15 - Wireless Personal Area Network (WPAN) standard, commonly known as "Bluetooth", uses a device pairing process to communicate over distances from 1 to 100 meters. Standard IEEE 802.16 - Commonly known as WiMAX (Worldwide Interoperability for Microwave Access), uses a point-to-multipoint topology to provide wireless broadband access. Global System for Mobile Communications (GSM) - Includes Physical layer specifications that enable the implementation of the Layer 2 General Packet Radio Service (GPRS) protocol to provide data transfer over mobile cellular telephony networks. Other wireless technologies such as satellite communications provide data network connectivity for locations without another means of connection. Protocols including GPRS enable data to be transferred between earth stations and satellite links. In each of the above examples, Physical layer specifications are applied to areas that include: data to radio signal encoding, frequency and power of transmission, signal reception and decoding requirements, and antenna design and construction. As the technology has developed, a number of WLAN Ethernet-based standards have emerged. Care needs to be taken in purchasing wireless devices to ensure compatibility and interoperability. IEEE 802.11a - Operates in the 5 GHz frequency band and offers speeds of up to 54 Mbps. Because this standard operates at higher frequencies, it has a smaller coverage area and is less effective at penetrating building structures. Devices operating under this standard are not interoperable with the 802.11b and 802.11g standards described below. IEEE 802.11b - Operates in the 2.4 GHz frequency band and offers speeds of up to 11 Mbps. Devices implementing this standard have a longer range and are better able to penetrate building structures than devices based on 802.11a. IEEE 802.11g - Operates in the 2.4 GHz frequency band and offers speeds of up to 54 Mbps. Devices implementing this standard therefore operate at the same radio frequency and range as 802.11b but with the bandwidth of 802.11a. The IEEE 802.11n standard is currently in draft form. The proposed standard defines frequency of 2.4 Ghz or 5 GHz. The typical expected data rates are 100 Mbps to 210 Mbps with a distance range of up to 70 meters. The benefits of wireless data communications technologies are evident, especially the savings on costly premises wiring and the convenience of host mobility. However, network administrators need to develop and apply stringent security policies and processes to protect wireless LANs from unauthorized access and damage. These wireless standards and Wireless LAN implementations will be covered in more detail in the LAN Switching and Wireless course. 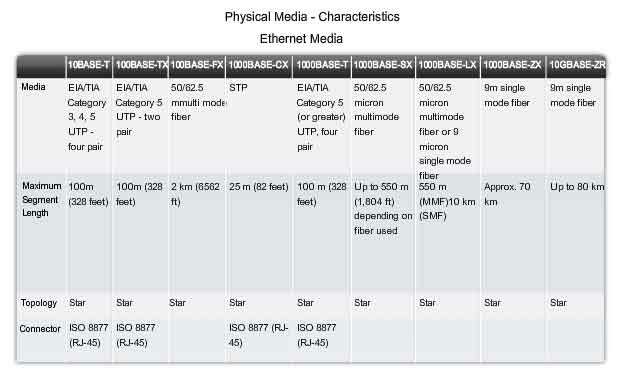 Different Physical layer standards specify the use of different connectors. These standards specify the mechanical dimensions of the connectors and the acceptable electrical properties of each type for the different implementations in which they are employed. Although some connectors may look the same, they may be wired differently according to the Physical layer specification for which they were designed. The ISO 8877 specified RJ-45 connector is used for a range of Physical layer specifications, one of which is Ethernet. Another specification, EIA-TIA 568, describes the wire color codes to pin assignments (pinouts) for Ethernet straight-through and crossover cables. 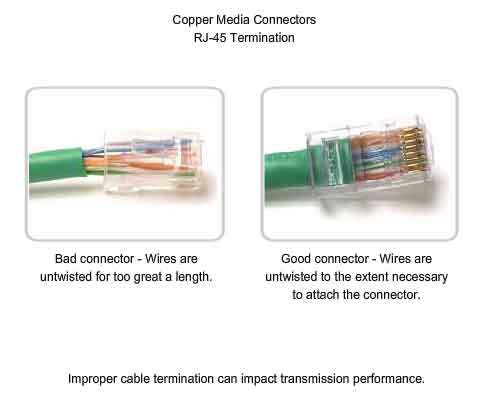 Although many types of copper cables can be purchased pre-made, in some situations, especially in LAN installations, the termination of copper media may be performed onsite. These terminations include crimped connections to terminate Cat5 media with RJ-45 plugs to make patch cables, and the use of punched down connections on 110 patch panels and RJ-45 jacks. The figure shows some of the Ethernet wiring components. Each time copper cabling is terminated, there is the possibility of signal loss and the introduction of noise to the communication circuit. Ethernet workplace cabling specifications stipulate the cabling necessary to connect a computer to an active network intermediary device. When terminated improperly, each cable is a potential source of Physical layer performance degradation. 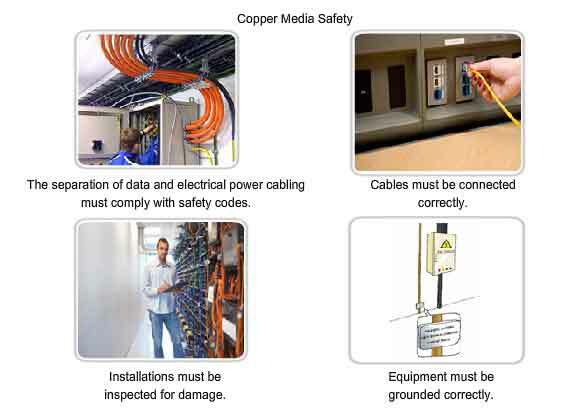 It is essential that all copper media terminations be of high quality to ensure optimum performance with current and future network technologies. In some cases, for example in some WAN technologies, if an improperly wired RJ-45-terminated cable is used, damaging voltage levels may be applied between interconnected devices. This type of damage will generally occur when a cable is wired for one Physical layer technology and is used with a different technology. Straight-Tip (ST) (trademarked by AT&T) - a very common bayonet style connector widely used with multimode fiber. Subscriber Connector (SC) - a connector that uses a push-pull mechanism to ensure positive insertion. This connector type is widely used with single-mode fiber. 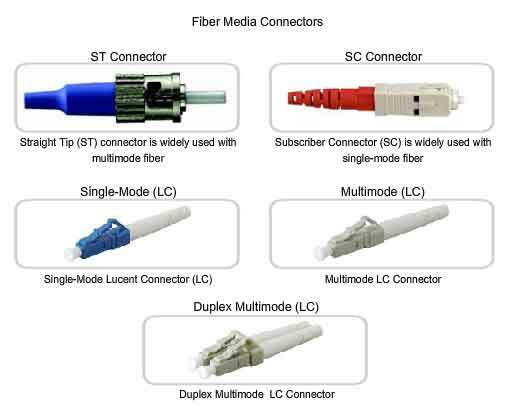 Lucent Connector (LC) - A small connector becoming popular for use with single-mode fiber and also supports multi-mode fiber. Terminating and splicing fiber-optic cabling requires special training and equipment. Incorrect termination of fiber optic media will result in diminished signaling distances or complete transmission failure. It is recommended that an Optical Time Domain Reflectometer (OTDR) be used to test each fiber-optic cable segment. This device injects a test pulse of light into the cable and measures back scatter and reflection of light detected as a function of time. The OTDR will calculate the approximate distance at which these faults are detected along the length of the cable. A field test can be performed by shining a bright flashlight into one end of the fiber while observing the other end of the fiber. If light is visible, then the fiber is capable of passing light. Although this does not ensure the performance of the fiber, it is a quick and inexpensive way to find a broken fiber.